Police in Stranraer have arrested and charged a 23 year-old man with wasting police time following enquiries into an alleged stabbing incident. 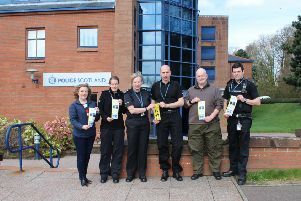 Officers in Stranraer were looking for witnesses to an incident alleged to have taken place in the Agnew Crescent area of Stranraer between 8.30pm and 9pm on Saturday 4th March. During this time a 23 year-old male was reported to have been confronted by another male at knifepoint who attempted a theft and then stabbed the man before fleeing. Police say they are no longer looking for anyone else in respect of the original alleged robbery.